By the way, this guide only covers federal (U.S. government) contracts. If you are looking for a comprehensive guide that covers both federal and local government opportunities, read “How to Find and Get Government Contracts“. Should you bid for federal contracts? Think of a prospective client that buys almost any imaginable product, in large quantities, and pays on time. For many businesses, that sounds like a great client, doesn’t it? Well, that client is the U.S. government. Federal agencies purchase products every day from suppliers of every size. They make purchases regardless of how the economy is doing, in good times and bad. For many companies, winning federal contracts can be a way to increase their financial stability while diversifying revenues. Furthermore, the U.S. government has a mandate to work with small and growing businesses. It has various programs designed to help small businesses win government contracts. However, federal contracts are not for everyone. Contrary to popular myth, the government does not usually overpay for things. Quite to the contrary. The federal government has numerous procurement officers who excel at negotiating contracts. It’s not unusual for government orders to have very thin profit margins, from 2% to 10%. However, you can get higher margins if you sell a unique product or service. Lastly, finding, bidding for, and managing government contracts can be cumbersome. This burden can affect small businesses that don’t have a lot of resources. Your first step in the process of becoming a federal contractor is to register in the System for Award Management. You cannot do business with the federal government until you register. Before you register, get a DUNS Number from Dun and Bradstreet. A DUNS number is a unique number that identifies your company. Getting a DUNS number should not cost you anything. The U.S. government posts all contracting opportunities in the FedBizOpps system. The system lets you use a search engine to browse available opportunities. FedBizOpps is comprehensive and covers all agencies and locations. You can search for opportunities based on territory, set-aside code, type, or agency. The advanced search feature also allows you to search by NAICS code and other parameters. Although the system is relatively easy to use, it takes some getting used to. Most people should be able to use the system relatively well in a couple of hours. For example, let’s say that a company sells computer systems and peripherals and wants to review government opportunities. 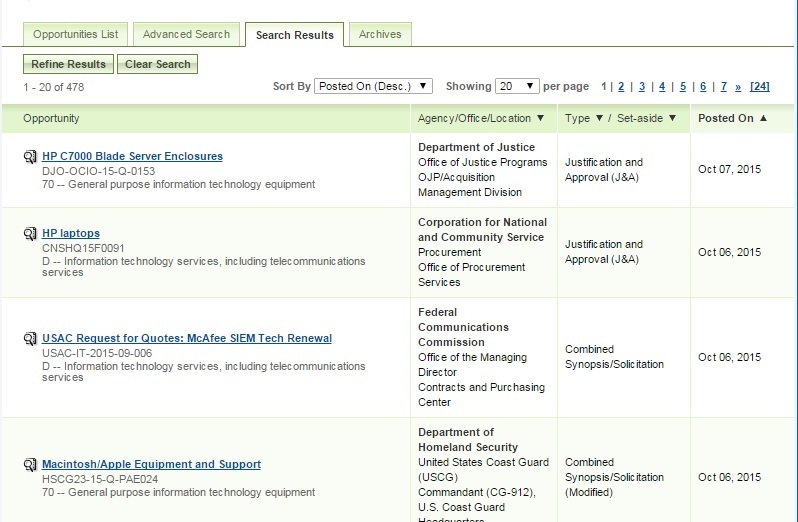 In this case, they search NAICS code 423430, “Computer and Computer Peripherals.” Here are the results of this very broad search. Note that there are 24 pages of opportunities. The federal government has a mandate to help small businesses sell to the government. This mandate includes “special designations” that can help you by making your offerings more attractive to federal buyers. Getting one or more special designations can often make the difference between winning and losing a contract. Designations include 8(a) Business Development, HubZone, Small disadvantaged business, Service-disabled veteran-owned, and Women-owned business. Each of these designations has different qualification requirements and usually requires certification. Bidding on federal contracts is a very important matter. Your company should bid only for opportunities that it can fulfill. Review the details of the government request and submit a bid only if you are certain you can fulfill it. Line up your resources, such as vendors, financing, and employees ahead of time. Defaulting on a government contract can have serious consequences for a business. Most government contracts are large, at least from the point of view of a small business. It’s common for small companies to avoid bidding on larger contracts because they don’t have the financial resources to fulfill the order. Small businesses may not be able to afford to wait 30 to 60 days to get paid by the government. Or they may not have the funds to cover their vendor costs. If you require external funding, get it before you win the government contract. Otherwise, you might have a contract that you must fulfill – but don’t have the funds to do so. One of the challenges of working with the federal government is that it usually pays invoices in 30 to 60 days. This delay can affect small vendors who cannot afford to wait that long for a payment. A simple way to solve this problem is to finance your invoices with a factoring program. Factoring provides you with an advance for your slow-paying invoices. This funding improves your cash flow. Qualifying for a factoring plan is relatively easy. Plans can be set up in a couple of days. Learn more about factoring and financing government receivables. Getting a large purchase order can be seen as a blessing, unless you don’t have the funds to pay your vendors. Purchase order funding can help by covering your supplier expenses associated with a specific order. This financing enables you to complete the order and get the revenues. This solution can be used only by companies that resell finished goods. Learn more about PO financing for government vendors. The Small Business Administration (SBA) has a number of programs that help provide financing for small businesses. You can find more information here. Are you a federal government contractor in need of funding? We offer competitive factoring and purchase order funding plans. For more information, fill out this form or call us toll-free at (877) 300 3258.